Neurolymphomatosis (NL) is a rare manifestation of non-Hodgkin lymphoma, in which malignant cells infiltrate the peripheral nerves. Most patients are treated with high-dose methotrexate (HD-MTX)-based systemic chemotherapy regimens similar to patients with central nervous system lymphoma. However, because NL is rare, the efficacy of HD-MTX is largely unknown. We reviewed medical records of patients diagnosed with NL over the past 10 years and identified 18 patients. 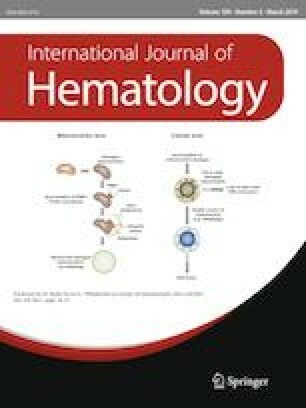 The underlying hematological malignancy was diffuse large B-cell lymphoma (DLBCL) in 10 patients (55.6%), intravascular large B-cell lymphoma in six (33.3%), and other types in two patients. Ten patients were treated with HD-MTX-based systemic chemotherapy; the response rates with and without HD-MTX-based chemotherapy were 100% (n = 10) and 85.7% (n = 6), respectively (P = 0.41). The median progression-free and overall survival rates of patients with versus without HD-MTX treatment were 6.4 vs. 8.5 months (P = 0.97) and 13.5 vs. 8.5 months (P = 0.63), respectively. Despite the initial favorable responses, rapid disease recurrence was observed in most patients administered HD-MTX-based chemotherapy. Our observations suggest that HD-MTX-based chemotherapy may have insufficient efficacy against NL, and that other therapeutic approaches are required to improve the outcomes of patients with this rare disease. HK and KM planned and designed the study, collected the data, and wrote the manuscript. HK, KM, YA, DM, KN, AK, and MT performed patient care activities. All authors reviewed the manuscript. All procedures involving human participants in this study were in accordance with the ethical standards of the institutional and national research committee as well as the 1964 Helsinki Declaration and its later amendments or comparable ethical standards.